Caj Chai is a teahouse and shop. The tea experience starts from the moment you step into this place and start inhaling all sorts of spices. The first thing you notice is the décor; subtle lighting, bare brick walls with furniture consisting of a retro style surrounded by thousands of teas and cutlery for tea drinking and brewing. The atmosphere is very relaxing and sophisticated. The menu consists of more than 140 teas and infusions. It is divided into tea categories (white tea, green tea, oolong tea, black tea, red tea and chai). A good first step is to decide which of these categories you prefer as then each one has a varied selection to chose from. In each category you will find teas from different countries like China, Japan, Korea, Taiwan, Nepal and India. 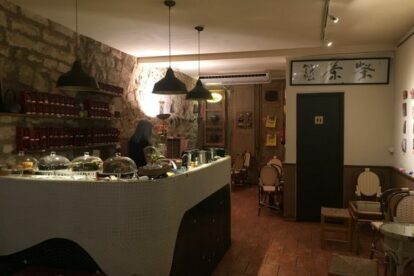 One of the best things about this place is that you can time travel not only with the flavours but with the whole experience on how the tea is served, always following the serving accessories from the country of origin. To accompany your tea, they offer a variety of pastries such as green tea mochi, or gluten free brownies. And for those of you real tea lovers, they also have tea workshops, courses and tastings. No alcohol, no wifi, no stress, just a cup of tea in hand :).